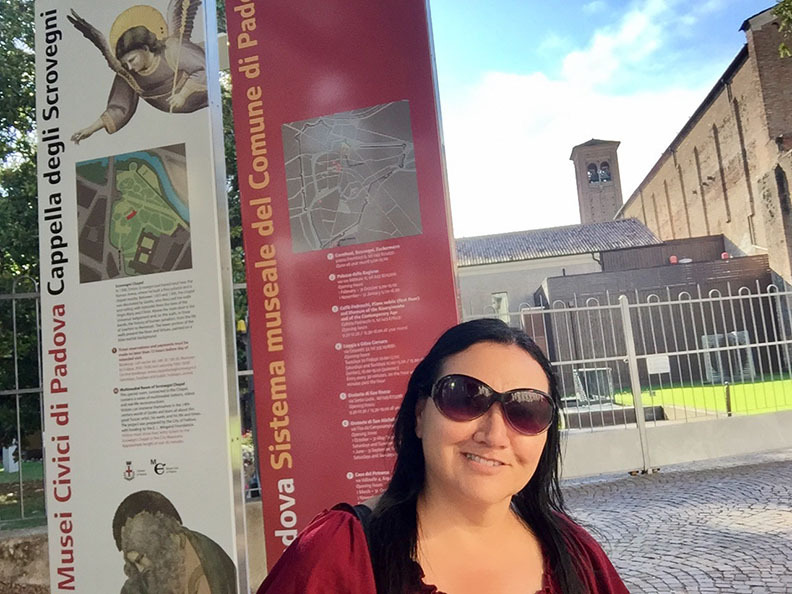 Today I spent the whole day in Padova, Italy. It was nice to walk around the Airbnb apartment and explore the town. 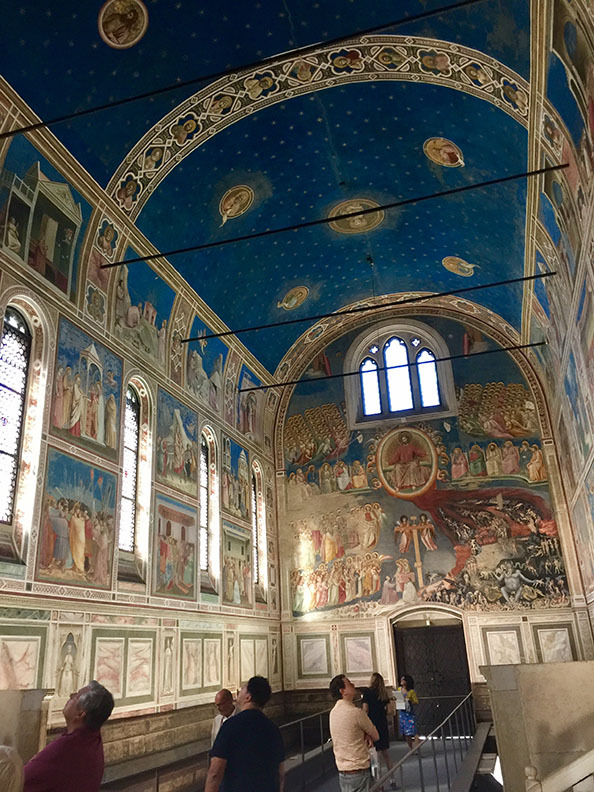 While in Padova, I knew I had to visit the Cappella degli Scrovegni. The Cappella degli Scrovegni, is a church in Padova, Italy. It contains a fresco cycle by Giotto, completed about 1305 and considered to be an important masterpiece of Western art. The chapel is medievil chapel covered with frescoes which narrate events in the lives of the Virgin Mary and Christ. On the wall opposite the altar is the grandiose Universal Judgement, which concludes the story of human salvation. The chapel was originally attached to the Scrovegni family palace, built after 1300, following the elliptical outline of the remains of the Roman arena. I was super-excited about visiting this chapel. 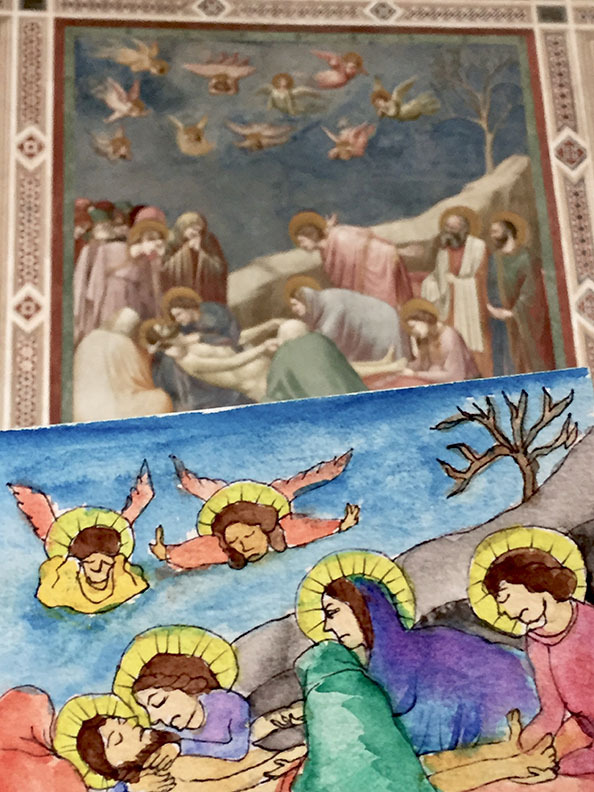 On the left side of me, is Giotto’s “Cruxifixion” and on the right is the infamous “Lamentation of Christ”. 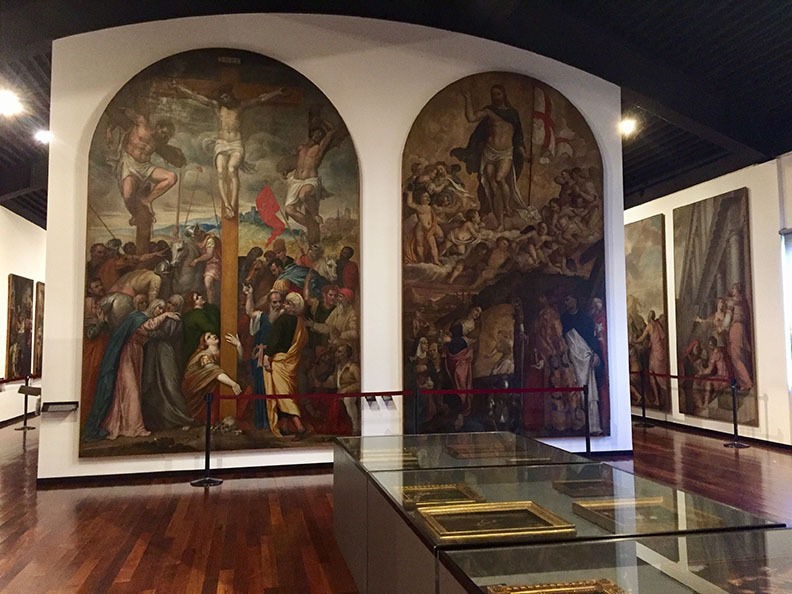 Prior to this visit, I had only seen these panels in art history books. I was so happy and inspired to be here, that I made another postcard to send to a friend back home. 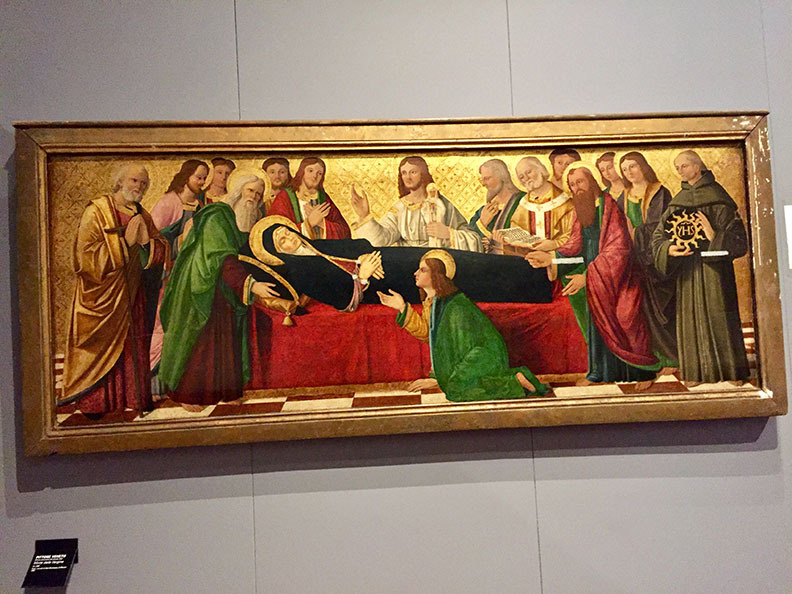 Giotto’s Cappella degli Scrovegni is on the grounds of the Eremitani Museum, a Roman & pre-Roman artifact museum which also houses artwork from the 14th-18th century. The Death of the Virgin Mary is a common subject in Western Christian art, the equivalent of the Dormition of the Theotokos in Eastern Orthodox art. This depiction became less common as the doctrine of the Assumption gained support in the Roman Catholic Church from the late Middle Ages onward. Although that doctrine avoids stating whether Mary was alive or dead when she was bodily taken up to Heaven, she is normally shown in art as alive. Nothing is said in the Bible about the end of Mary’s life, but a tradition dating back to at least the 5th century says the twelve Apostles were miraculously assembled from their far-flung missionary activity to be present at the death, and that is the scene normally depicted, with the apostles gathered around the bed. 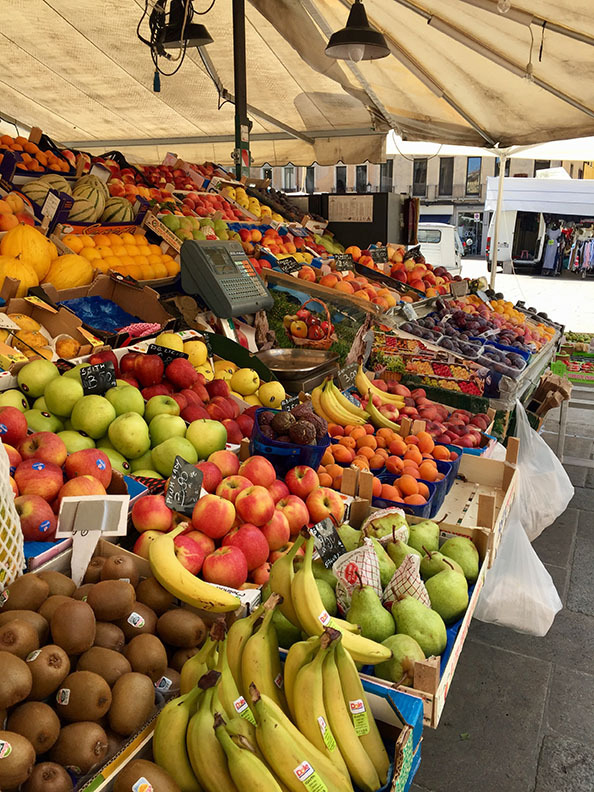 After a day of looking at beautiful art, I walked to the local Farmer’s Market in the Piazza dei Frutt and bought some fruit. At the end of the day, I met up with my cousins and we had dinner at Caffè Patavino in the Piazza dei Frutt. 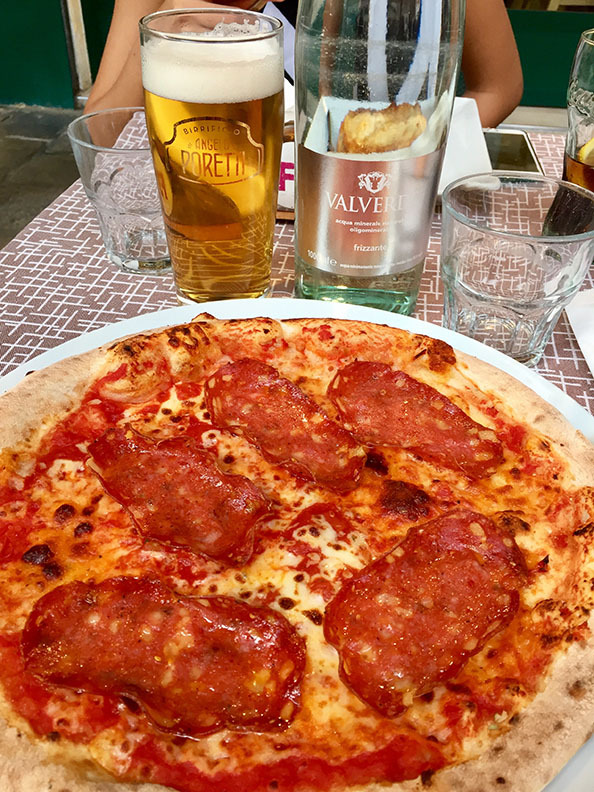 I have to say that this was the BEST PIZZA I EVER ATE IN MY WHOLE LIFE!!! It was so good, that I ordered another one to go. From Rome, we got on the train to Padova, Italy. We arrived in the evening and spent the following day in Florence. 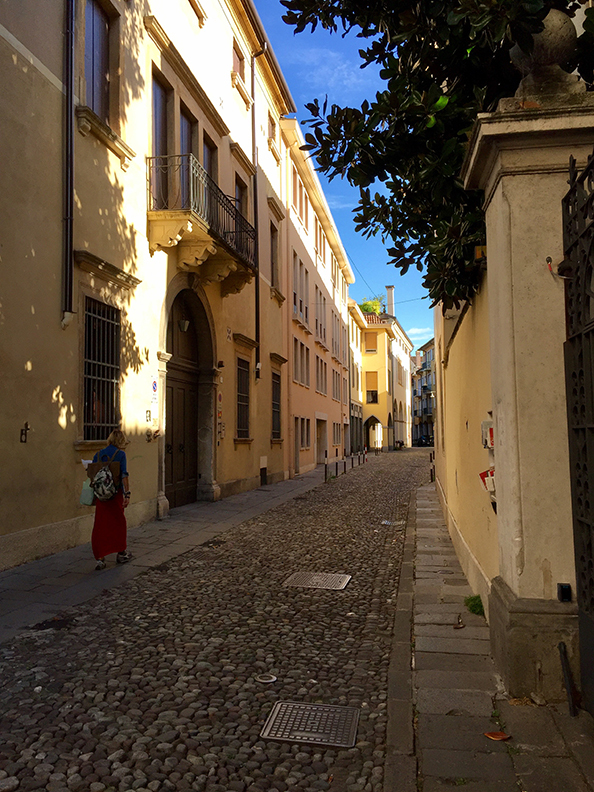 We arrived in the evening to Padova, Italy, where we spent the following three days in the cutest Aribnb apartment. This is the front entrance, on the left is the arched door that leads to the courtyard of the property. This is the inside hallway of our apartment in Padova. Took the train to spend the whole day in Florence. 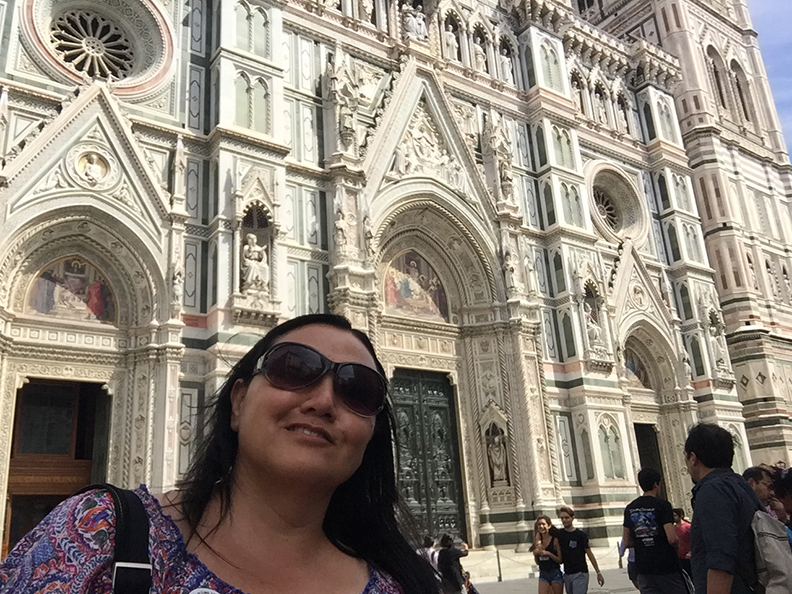 In the middle of the town square and only a few blocks from the train station is the Florence cathedral, Santa Maria del Fiore. It stands tall over the city with its magnificent Renaissance dome designed by Filippo Brunelleschi. The cathedral is a Gothic structure built on the site of the 7th-century church of Santa Reparata, the remains of which can be seen in the crypt. Florence is one of my all-time favorite places to visit. 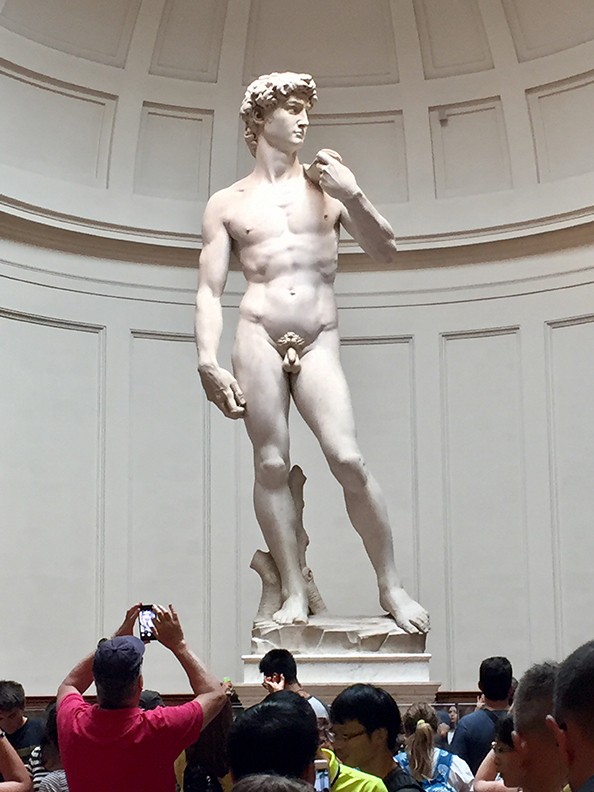 My next stop was the Galleria dell’Accademia di Firenze, or “Gallery of the Academy of Florence”, it’s an art museum which is best known as the home of Michelangelo’s sculpture of David. 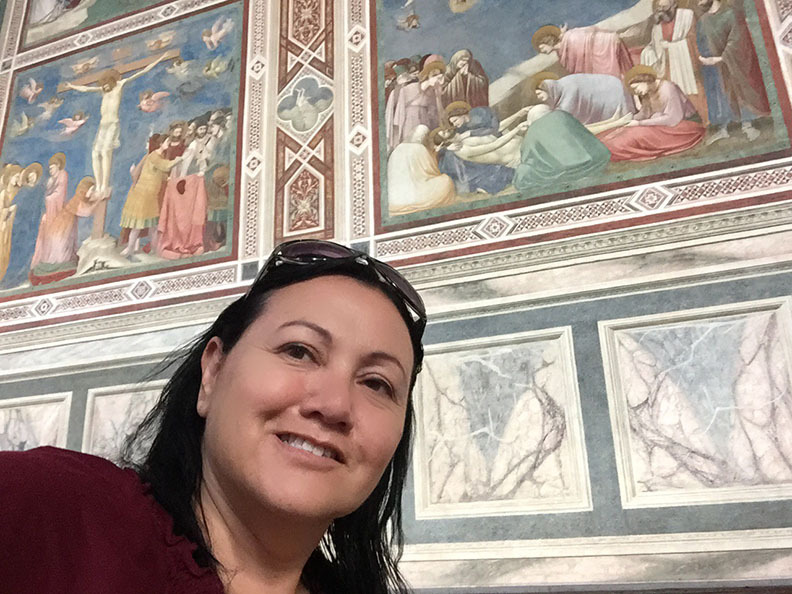 Afterwards, I walked over to the Uffizi Gallery, which is a prominent art museum located adjacent to the Piazza della Signoria in the Historic Centre of Florence in the region of Tuscany. This is one of the most important Italian museums, and one of the largest and best known in the world. It holds a collection of priceless works, particularly from the period of the Italian Renaissance. This is the “Fortitude”, a painting by Italian Renaissance master Sandro Botticelli, finished in 1470. Fortitude is the first recorded work by Botticelli. 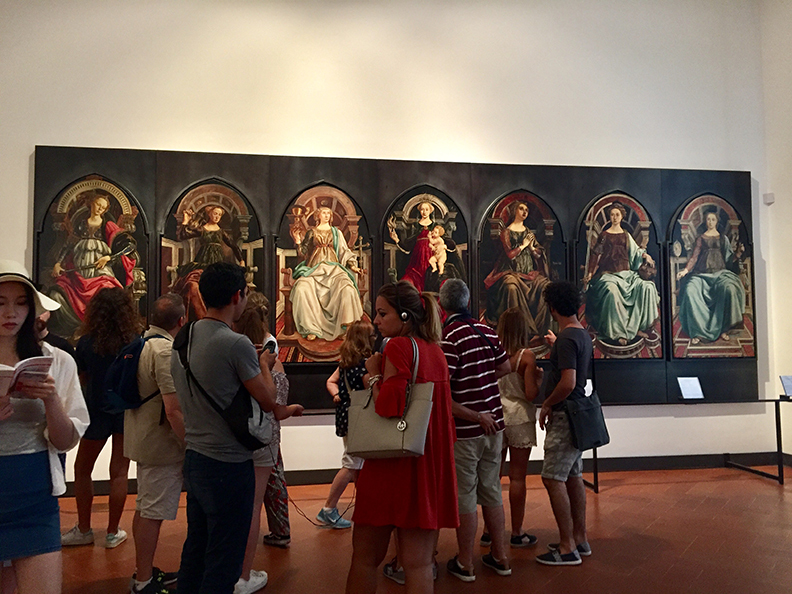 (the panel on the right) This work originally belonged to a set of seven panels representing Virtues, intended to decorate the Tribunal Hall of Piazza della Signoria in Florence. 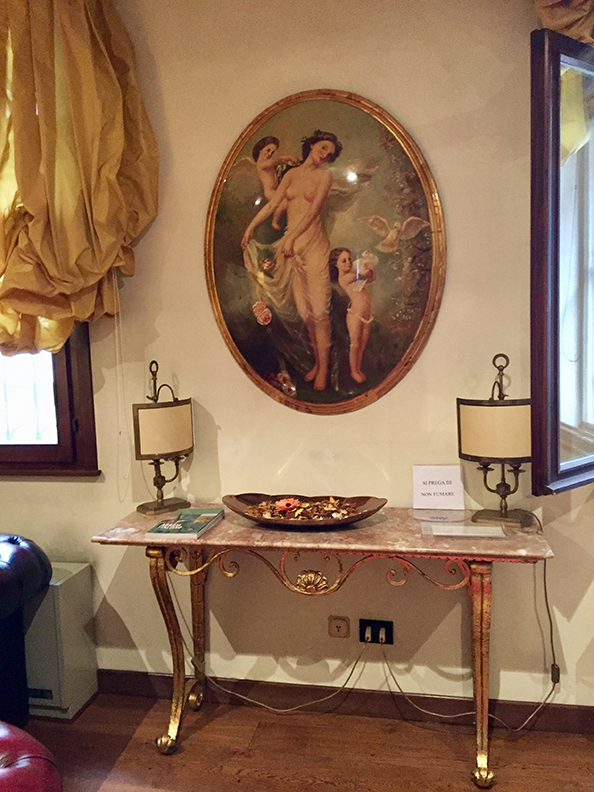 The other six panels are painted by Pietro Pollaiolo’s workshop. 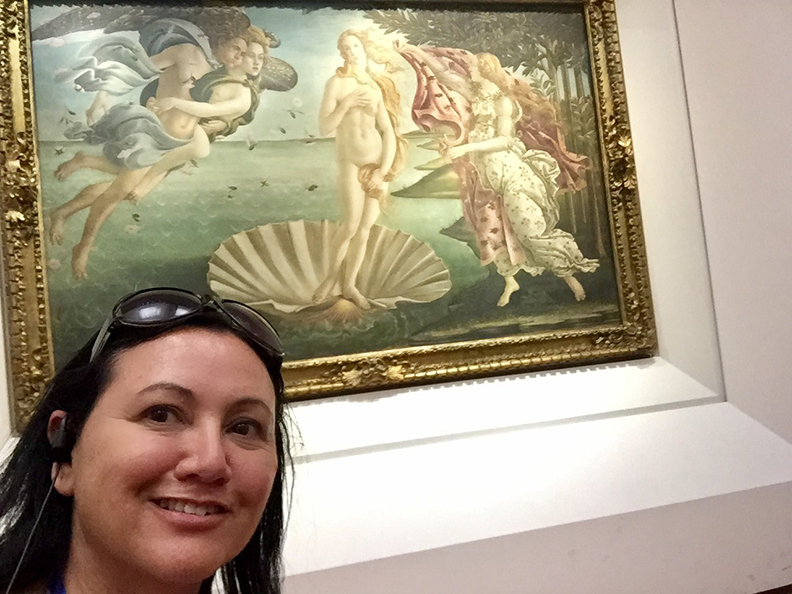 Another of my favorite Sandro Botticelli’s great work, done for the Medici family, is the Birth of Venus. Actually, I love all of the Botticelli artworks here. Unfortunately, we do not know for sure which Medici it was painted for, or which location it was originally hung in. 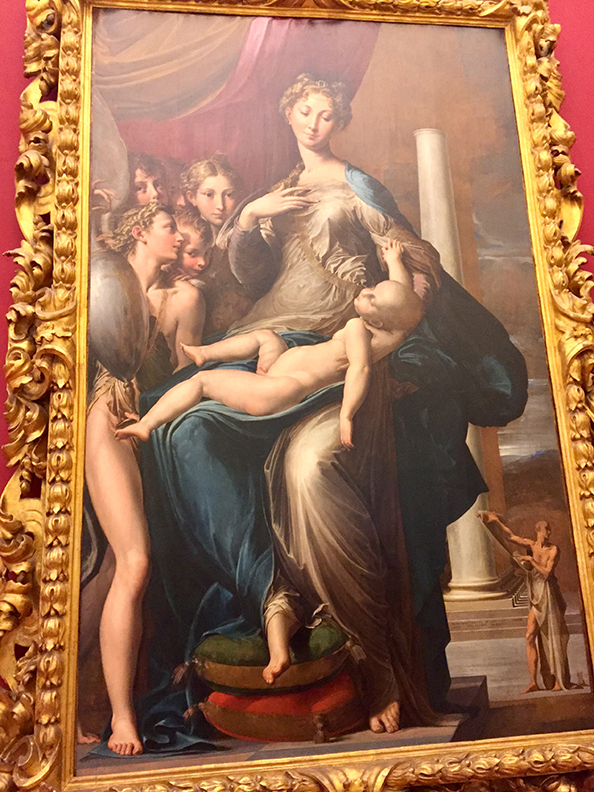 Another favorite work of art here, among many, is the “Madonna with the Long Neck” by Parmigianino. This is typical of his later work, which was defined by unusual spatial compositions and elongated figures. The painting is also known as “Madonna and Child with Angels and St Jerome” but earned the name Madonna with the Long Neck because of the curious length of the Madonna’s swan-like neck. The subject of this piece is derived from medieval hymns which compared the Virgin’s neck to a great ivory tower or column. Therefore the exaggerated length of the Virgin’s limbs and those of her son and the presence of columns in the background of the painting, are symbolic of the painting’s religious value. I can’t stress how amazing it was to see every work of art here. I can’t wait to go back. 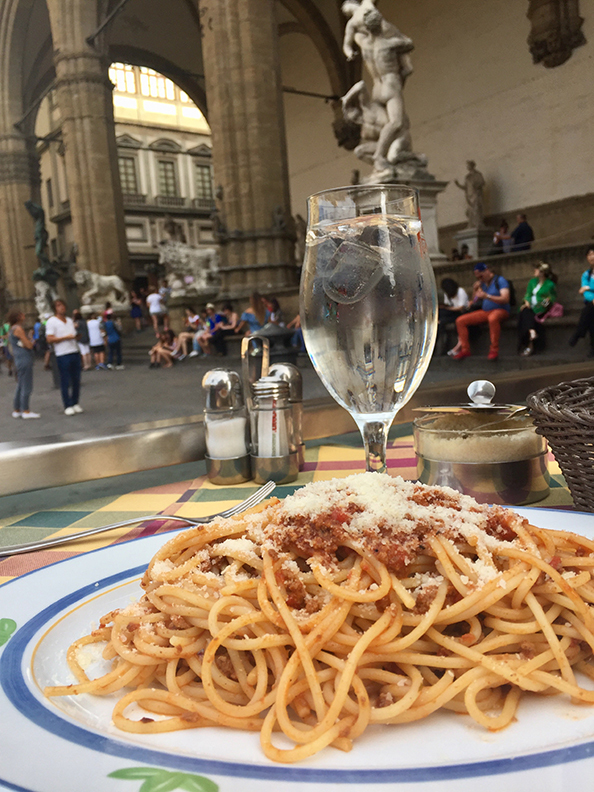 After a long day of enjoying renaissance art, I had a spaghetti dinner at Ristorante Orcagna in the Piazza della Signoria. Dinner with a view of the plaza. And last but not least, before heading back to meet my family at the train station to head back to Padova, I had a gelato. 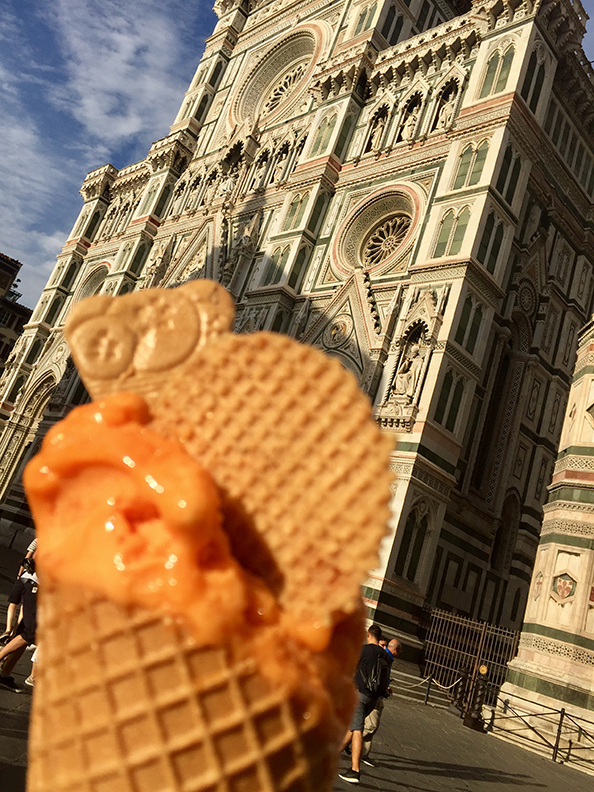 No trip to Florence is complete without having gelato. I tried the cantaloupe this time.